Is it too early to start organising the twelve pubs of Christmas for you and you’re friends? I say it’s never too early. With only roughly four weeks to go until Christmas week let’s take a look at some rules for your night out! 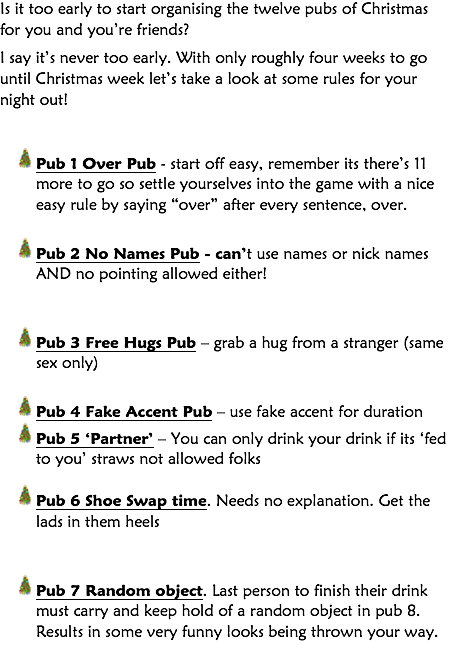 Pub 1 Over Pub – start off easy, remember its there’s 11 more to go so settle yourselves into the game with a nice easy rule by saying “over” after every sentence, over. Pub 2 No Names Pub – can’t use names or nick names AND no pointing allowed either! Pub 7 Random object. Last person to finish their drink must carry and keep hold of a random object in pub 8. Results in some very funny looks being thrown your way. Pub 8 Left hand only. While the random object is taking up all the attention the rest of ye take a breather and drink with your left hand only. Pub 10. Drink in the toilets. Take the party to the loo! Pub 11. You can only speak as Gaeilge. Pulling a sentence together in English at this point can be tricky, let alone one in Irish. Pub 12. Take a sit. Grab a glass of water and have a laugh. Let’s be honest everyone forgot about the rules by Pub 7 anyway. Just remember to be careful and enjoy the night! Don’t forget your Christmas Jumper!! Wouldn’t be the same without everyone wearing one!